This white bean chili is delicious and perfect for those cold days. Add chicken or leave it out depending on your meat eating status. The same goes for using vegetable or chicken broth. I used vegetable broth so the vegetarians and the meat eaters both could enjoy this soup. This was a hit in our house! Heat oil and cook onion and garlic for 2-3 minutes. Add broth, tomatoes, chilies, and spices. Bring to a boil. Reduce to simmer and cook for around 8-10 minutes. Add corn, beans, and chicken if desired. 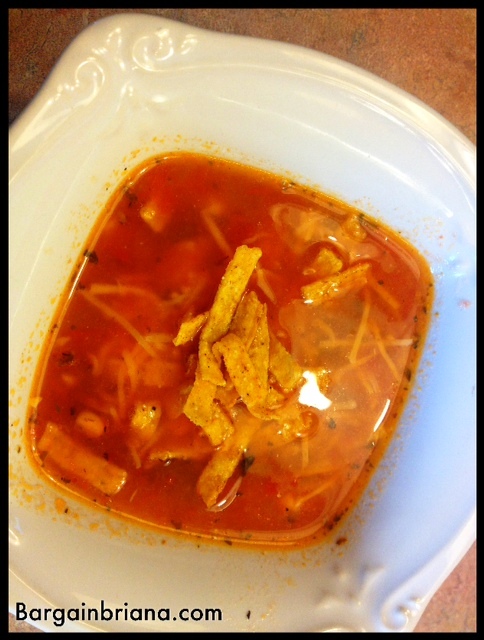 Garnish with tortilla strips, sour cream, and shredded cheese.